The Henschel Hs 123 was a single-seat biplane dive bomber and close-support attack aircraft flown by the German Luftwaffe during the Spanish Civil War and the early to midpoint of World War II. Although an obsolete design, it proved to be robust, durable and effective especially in severe conditions. It continued to see front-line service until 1944, only to be withdrawn due to a lack of serviceable airframes and spare parts. MMP (Mushroom Model Publications) is based in the UK. All their books and the scale plans are printed in Sandomierz, Poland by Stratus in English. Stratus also publishes books in the Polish language. This scale plan set comes in a soft cover portfolio sleeve that is 8 ¼” x 11 ¾” format. The background of it is dark green with line drawings of a Yak 3 fighter. 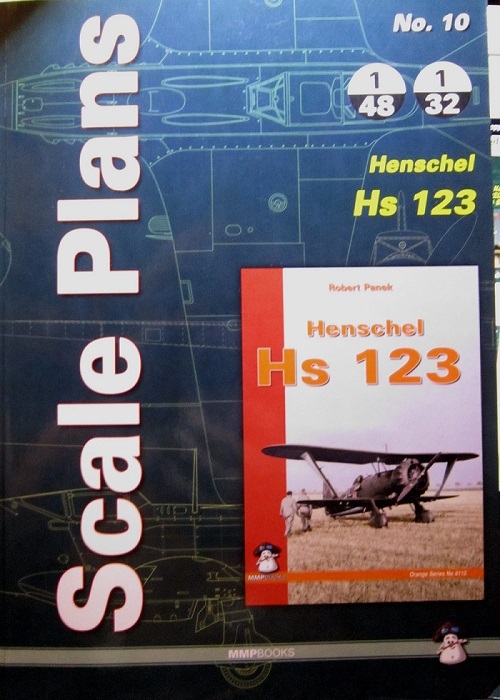 The box art of MMP’s book on the Henschel Hs-123 is on the cover. The portfolio contains line drawings of the Hs 123 in 1/48th and 1/32nd scale. Inside the portfolio are large 16 ½” by 11 ¾” pages folded in the center to fit the sleeve. These pages can be removed to set on a workbench and use. Page 1 has line drawings in 1/48th scale as side profiles of the Hs 123 V1, V2, V4, V5 and V6. Page 2 has 3 views of the Hs 123A-O. The side, top and bottom in 1/48th. Page 3 has 3 views of the HS 123A-1. The top, left and right sides and illustrations of the interior bulkheads in the fuselage in 1/48th. Page 4 has another 3 view of the HS 123A-1. The top with upper wing removed and illustrated separately and the bottom in 1/48th. Page 5 has a 3 view of the Hs 123B-1. The top shown with upper wing removed, side and front in 1/48th. Page 6 has a another 3 view of the HS 123B-1, the bottom and the top and bottom of the upper wing in 1/48th. Page 7 has a side profile of the HS 123A-1 and illustrations of the interior bulkheads in the fuselage in 1/32nd. Page 8 has an upper illustration of the HS 123A-1 IN 1/32ND. Page 9 has a side and an upper illustration of the HS 123A-1 with the upper wing removed in 1/32nd. Page 10 has a side and front view of the HS 123B-1 in 1/32nd. Page 11 has a top view and upper wing illustration for the HS 123B-1 in 1/32nd. Page 12 has a bottom view of the HS 123B-1 in 1/32nd. This is one neat set of plans and will be of great interest to modelers of this aircraft or aircraft historians and enthusiasts. Highly recommended. I want to thank Dr. Roger Wallsgrove, Editor-in-Chief of MMP and the folks at Casemate for this review sample. The US distributor for MMP is Casemate Publications.